Serving size: Feeds 8 comfortably. 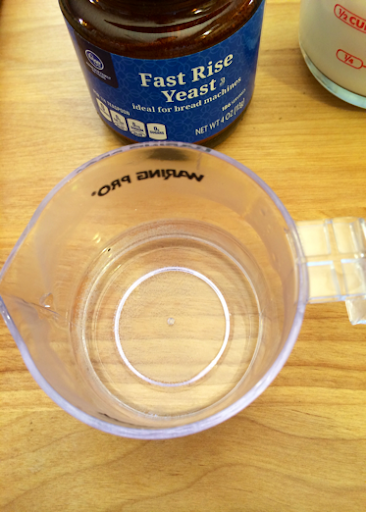 -1/4 cup (60 ml) warm water (not warmer than 110 degrees Fahrenheit or it'll kill your yeast). 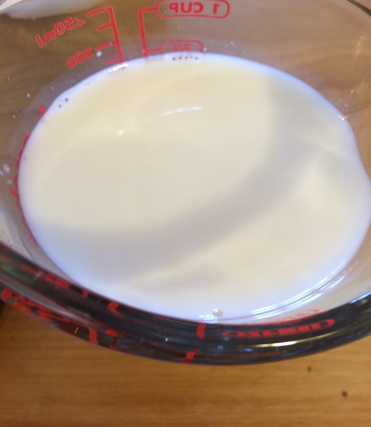 -3/4 cup (180 ml) warm milk (not warmer than 110 degrees Fahrenheit or it'll kill your yeast). -2 large eggs at room temperature (one of them beaten). 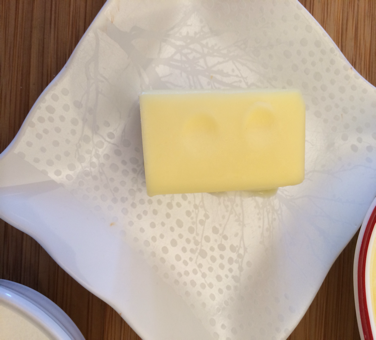 -1/4 cup (4 tablespoons/ half a stick) (60 ml) (60 gm) (2 oz) unsalted butter, softened. -1/4 cup (60 ml) (50 gm) (1-3/4 oz) granulated sugar. -1/2 teaspoon (3 gm) salt. -1/2 teaspoon cardamom powder (optional). -3 1/4 cups (780 ml) (450 gm) (16 oz) plain (all-purpose) flour. -Approximately 2 teaspoons (10 ml) (8 gm) dry yeast. 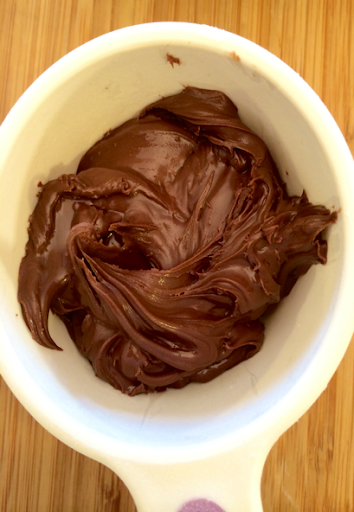 -1 cup Nutella OR jam/jelly of your choice (for spreading between the layers). -4 tablespoons of cooking oil. -In a bowl whisk the egg with milk, water, sugar, butter and yeast. Set aside in a warm place to let the yeast bloom (froth). -In another bowl sift the flour with the salt and the optional cardamom. 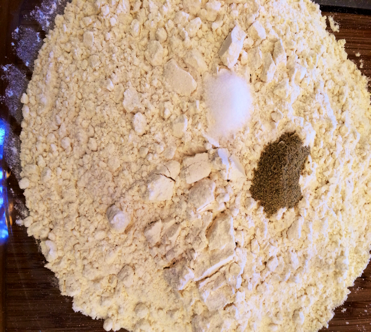 -Create a well in the center of the flour mixture. Add the liquid ingredients to the dry ingredients and knead until you get a smooth dough for about 20 minutes (I begin mixing with a wooden spoon then once the dough is not too sticky, I proceed to knead it with my clean hands). 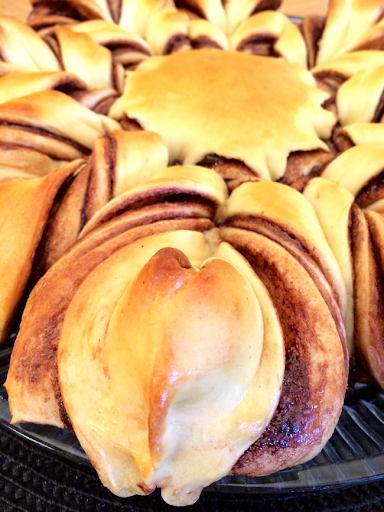 Note: This recipe requires between 3-1/4 cups of flour depending on the weather, humidity and the flour brand. Start with 3 cups and if you feel that the dough is too soft, add the extra 1/4 cup. 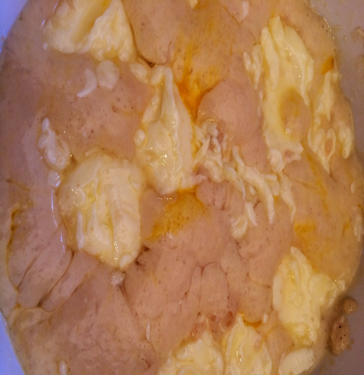 -Place the dough in a bowl you have brushed with the cooking oil and cover it with a wet cloth and leave it in a warm place to double in size (about 45 minutes). TIP: if you are short on time you can heat your oven to 390°F/200°C then turn it off and place your dough in a glass bowl and place it in the warm oven with the wet cloth covering the bowl. -After the dough has risen for the first time, remove it from the bowl and gently puch it down to release the built up air. I even enlisted the help of my little sous chef (after a thorough hand wash of course :) ). 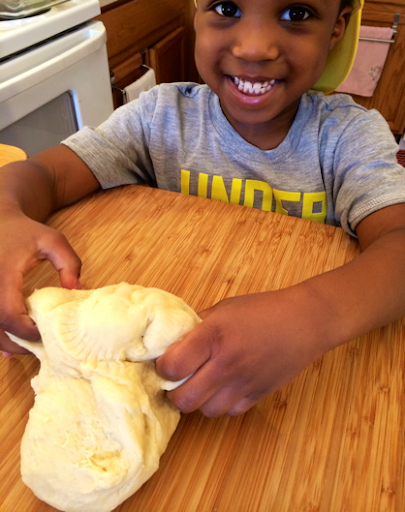 -Roll the dough into a smooth ball or a log and divide it into four equal pieces (work with one piece of dough at a time). -Lightly dust your working surface with some flour. Roll the first ball into a circle, at least 8 inches (20 cm) in diameter and 1/8 of an inch in thickness. 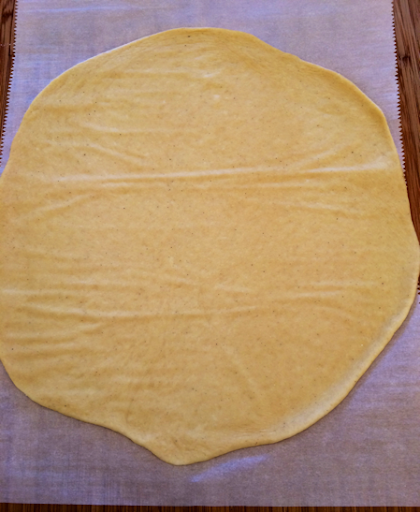 -Use your rolling pin to transfer the rolled out dough onto a sheet of parchment/baking paper. 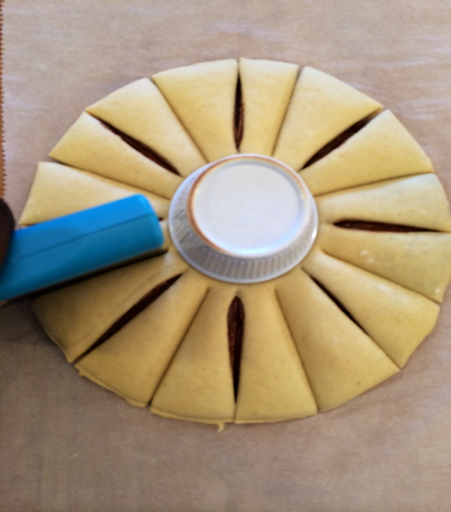 This will make it easier for you to move the rolled-out dough around without messing up it's shape. 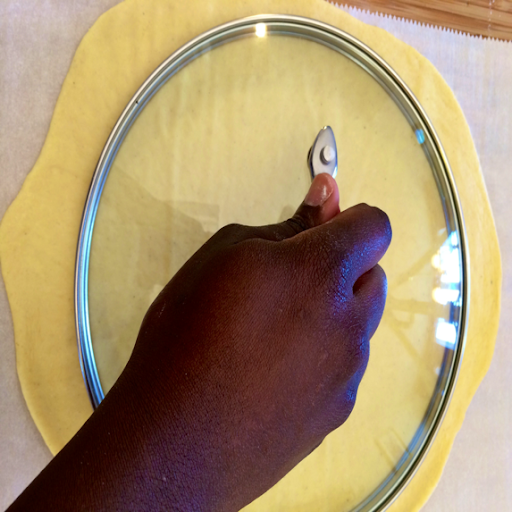 -Use a big circular object (like a dinner plate or pot cover) to lightly indent your rolled out dough with a circular shape (I used a pot cover). -Spread 1/3 of the Nutella inside the circular indent and all the way to its edges, being careful to stay within the indent (kind of like coloring with a crayon and staying within the lines). -Set the first layer (still on the parchment paper) aside. -Take the second ball of dough and roll it out on a lightly dusted surface just like you did the first layer. 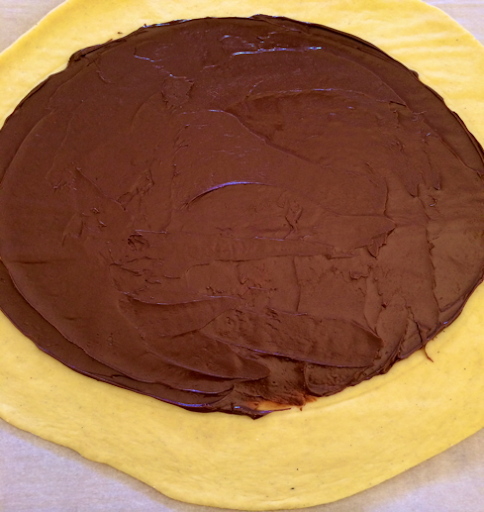 Use your rolling pin to transfer it onto the first layer of rolled-out dough that's covered in Nutella. -Using the same plate/pot cover you used on the first layer, create another indent over the second layer of rolled-out dough. 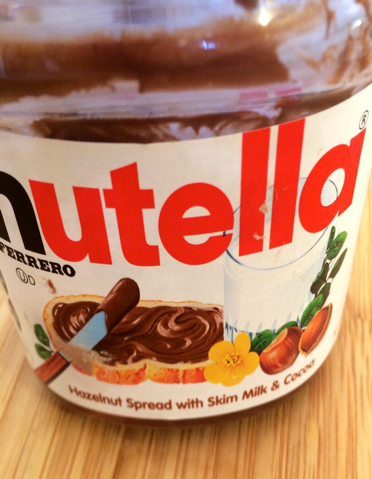 The objective here is to have a clearly marked out area in which to apply the Nutella. Repeat this step and the step above for the remaining two balls of dough HOWEVER, do not apply Nutella on the fourth (topmost) layer. -After you've assembled all four layers, place your plate or pot cover over the topmost layer and use either a knife or pizza cutter to cut off the excess dough surrounding the plate/pot cover (the parts without Nutella). 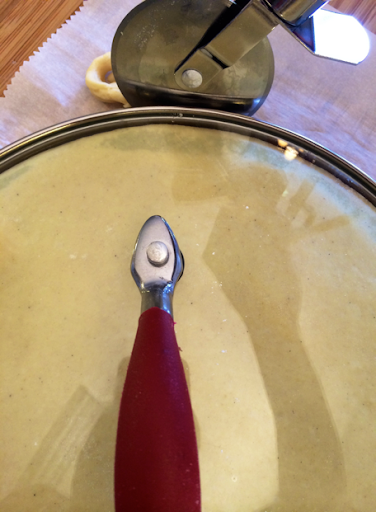 -Gently lift your pot cover/plate from the dough (it should now be a perfect circle). 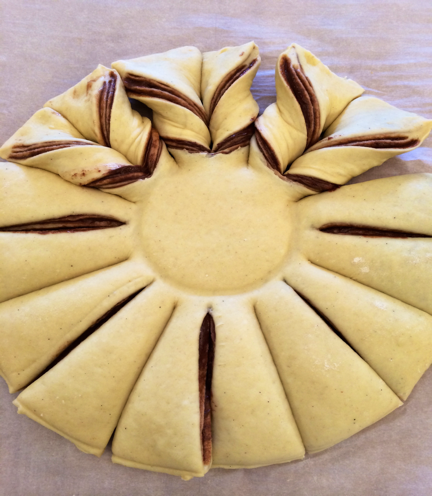 -Find the center part of your circular dough and place a small round object (I used a small condiment bowl) right in the middle. -Using a sharp knife or bench scraper (and with one hand placed on top of the small round object in the center of your dough), divide the dough into four equal parts (from above, the first cut will look like a cross). 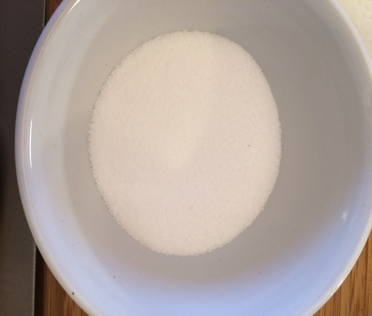 Start at the rim of the small round object you have placed in the center if the dough and cut through to the edge of the dough. Using the same method, divide each quarter you have created into two equal pieces, and then again into four equal pieces (you should have 16 equal pieces altogether See picture below. 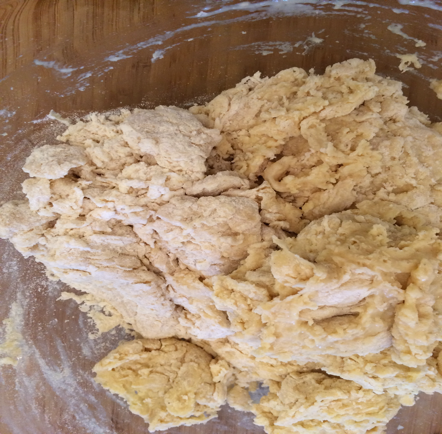 -Holding two of the dough sections next to each other at a time, twist the strands of dough twice away from each other and then pinch the ends together firmly to seal. 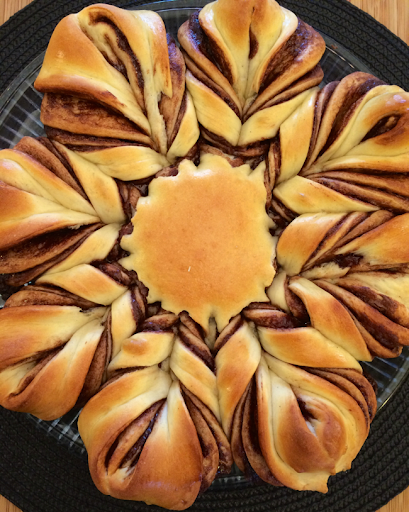 This is what will give the bread the swirled Nutella look. 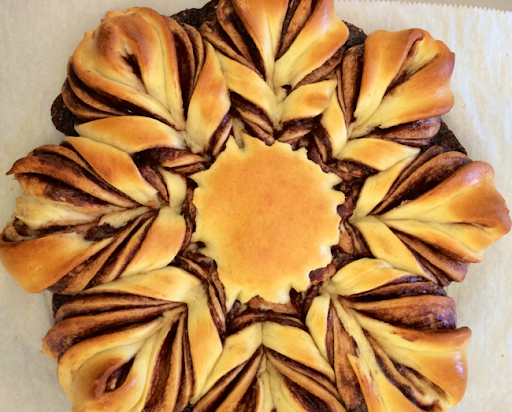 When you've twisted and shaped the whole round of dough, it should look like a flower with 8 petals. See picture below. 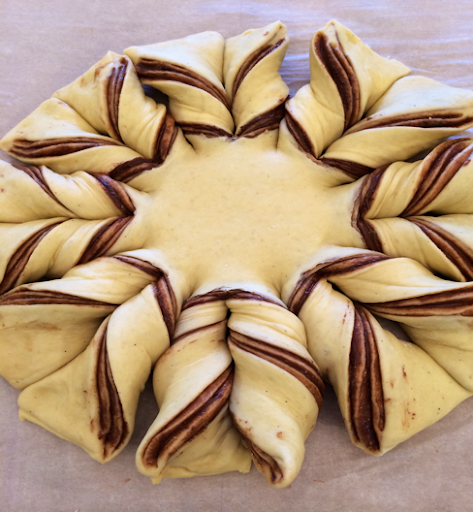 -Place the dough on a cookie sheet or baking sheet (while still,on the parchment paper). Cover with a damp, clean kitchen towel and let it raise for another 15-20 minutes. -Beat one egg and a tablespoon of tap water together to form an egg wash. 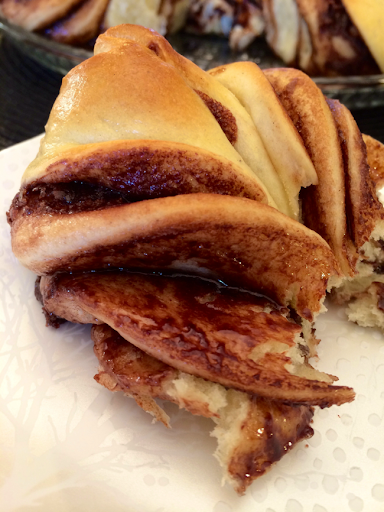 Using a pastry brush, gently brush the egg wash over the parts of the bread that do not have Nutella. This is what will give your bread a nice shiny appearance when baked. 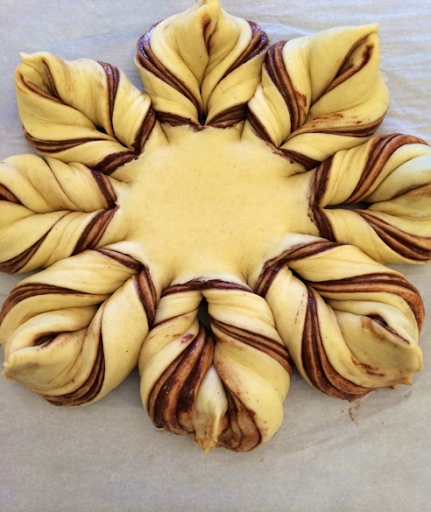 If you don't have a pastry brush, cut off a pice of strong, clean paper towel, fold it in half and twist one end. 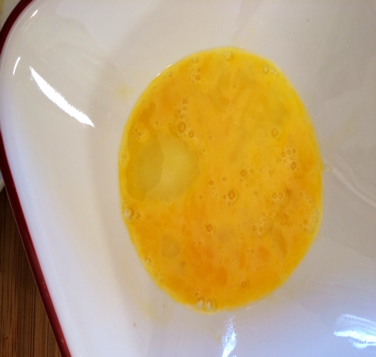 Use the untwisted end to dip in the egg and brush the egg wash over your bread. The twisted end will act as the "handle" of your disposable "brush". -Place the bread (while still on the parchment/baking paper) on a cookie sheet , baking sheet or pizza pan in the center rack of your oven. Bake the bread for 15-20 minutes (varies with every oven) or until your bread is a beautiful golden brown (I baked mine for exactly 15 minutes). Do not overbaked or your bread will be tough. Look at that!! That, my friends, is a thing of beauty. Enjoy!